Basic settings such as language, date, time, and tax rate will automatically start when you use the machine for the first time. The main display and printer will provide step-by-step setup guide. Casio Cash Register Se-s100 Basic settings such as language, date, time, and GST rate will automatically start when you use the Casio Cash Register for the first time. The main display and printer will provide step-by-step setup guidance. Simple character setting Characters can be easily entered from the 10-key keypad to set the department name and PLU name. The main display on the cash register enables you to confirm input characters at a glance. Electronic journal function The Electronic Journal function enables you to save the contents of sales transactions in built-in memory. 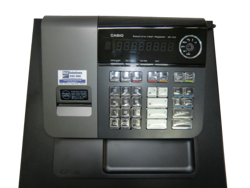 If you select the programming option for this cash register, our service team will setup your Casio Cash Register Se-s100 before we ship it. You can email your menu to us or we will contact you to discuss what we require to make sure your new Casio Cash Register Se-s100 is setup correctly .